There are two main elbow injuries that can occur during the golf swing. These are tennis elbow and golfer's elbow. Some factors that could lead to these injuries are poor mechanics, weakness, overuse, and poor warmup. Both injuries can be classified under the heading of tendonitis, as they are both inflammation at the tendon attachments. For reference, if you are standing with your arm at your side and palm facing forward, the outside of the elbow is on the thumb side, and the inside of the elbow is on the pinky side. These injuries are more common in the lead arm of the golf swing (left arm for right handed swing, and vice versa). One of the best things that you can do if you have either of these golf injuries is to avoid any activity that aggravates your condition. Seems like common sense, but I no longer am surprised by people who continue to stress theses areas, and try to work through the pain. Working through the pain will only make these conditions worse! Activity modification is important, as is icing a couple times per day. Anti inflammatory medications can also help. One other thing to note about either one of these conditions: they can be extremely stubborn! For the most part, these will not heal overnight or in a few days. In the perspective of tennis elbow, there is not a great blood supply to that area so whenever the tissue is inflamed or damaged, it can take a considerable amount of time to heal. Actually, the more common of the two elbow injuries, tennis elbow is inflammation of the wrist extensor muscle attachment at the outside of the elbow. Technical name is lateral epicondylits. Typically injured with repetitive motions combined with grasping. Can be very tender to touch along the bone (lateral epicondyle), as well as along the muscles that attach to the outside of the elbow. Will cause some general weakness in the hand, particularly with any type of gripping activity. Severe cases could involve numbness/tingling related to radial nerve impingement. Treatment for this injury include rest, flexibility exercises, ice, massage, bracing and formal physical therapy. If you are experiencing these type of symptoms, I would first try to rest the arm and apply ice at no more that 20 minute intervals. Also, take a quick look at the Flexibility section of this site for some localized stretches in addition to many other exercises, specific for golfers. If symptoms do not resolve within 2-3 weeks, consider checking in with your physician or physical therapist for a more formal work up. Start with your elbow fully bent, and palm facing away from you. Bend your wrist so that your palm now faces the ground and hold this wrist position with your left hand. Slowly, extend your elbow until it is fully straight and you feel a light stretch across your forearm. Hold at least 15 seconds, preferably 30 seconds. Return to the starting position and repeat 3-5x. The technical name of this condition is medial epicondylitis. Defined as inflammation of the wrist flexor tendons at their attachment on the inside of the elbow. This pain may be localized to the bony point at the inside of the elbow, but may spread down the forearm. Main symptoms include: tenderness, stiffness at the elbow, pain with grasping/gripping, and possibly numbness/tingling extending down the forearm to the ring/pinky fingers. Caused by repetitive grasping with wrist motion. May be a chronic or acute condition. Weakness in the hand typically accompanies the pain at the elbow. Self treatment should include rest, ice, OTC medications, and flexibility exercises. 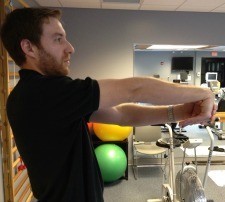 Physical therapy can also be indicated in more severe cases of golfer's elbow. Just like with lateral epicondylitis, rest and ice are recommended first, with some light stretching. If they do not help, consider seeing your physician or physical therapist. Start with your affected elbow bent, and palm facing you. Extend your wrist, so that your palm faces the ceiling, and hold this position with your opposite hand. Straighten your elbow until you feel the stretch. Hold 15-30 seconds. One very specific thing that you can do, in addition to those mentioned above, is overpressure. Overpressure simply involves you finding the most tender area on the lateral or medial side of your elbow and applying a firm, prolonged pressure to it (this will likely be uncomfortable!). You can use your opposite thumb to do this, or even a golf ball will work well. Once you find the spot, press and hold for at least 30 seconds. This pressure will allow the tissue to relax, and hopefully over time, become less painful. There are two main points during the golf swing where these tendons are placed under the most stress. The first is at the top of the back swing, on the transition to the downswing. Here, the forearm muscles are very active in gripping the club as the arms accelerate. The other point of stress is at the bottom of the downswing when the club impacts the ball. 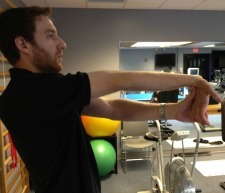 If you are looking to help prevent these elbow injuries from occurring, the two main things that you need to do are stretch and build strength. Flexibility exercises will lengthen the involved tissues and cause them to place less stress on their attachment points. While there are specific exercises to perform for the forearms and elbows, a full golf weight training routine is recommended not only to target these specific areas, but to increase the strength of all the other main joints in the upper extremities.